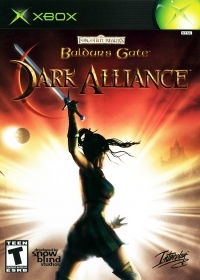 Immerse yourself in the fast-paced, dynamic world of Baldur's Gate: Dark Alliance. In this epic action RPG, play one of three unique characters as you explore visually stunning environments like bone-chilling ice caverns, marshy swamplands and forlorn tombs. Battle immense Frost Giants, brutal Dragons and hordes of other Dungeons & Dragons creatures. Use your wits, battle fiercely and emerge victorious! *A ground-breaking adventure, bringing the 3rd Edition Dungeons & Dragons rule set to Xbox for the first time. *Explosive spell effects and incredibly detailed creatures and environments maximize the power of Xbox technology, delivering a more realistic gaming experience. *Three customizable characters, each with distinctive powers, appearances and abilities that develop throughout the game. *Battle alone or export your character and join a friend in two-player cooperative mode. *Explore Baldur's Gate: Dark Alliance all over again, experiencing newfound adventures with a different customized character or replaying in Extreme mode for ten times the difficulty and fun. *Dolby Surround sound, real-time sound effect mixing, Hollywood voice talent and an original soundtrack by acclaimed composer Jeremy Soule. 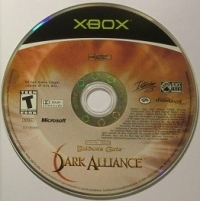 07-19-2014 kwisatzhaderach Box Text LIVE THE FANTASY Immerse yourself in the fast-paced, dynamic world of Baldur's Gate: Dark Alliance. In this epic action RPG, play one of three unique characters as you explore visually stunning environments like bone-chilling ice caverns, marshy swamplands and forlorn tombs. Battle immense Frost Giants, brutal Dragons and hordes of other Dungeons & Dragons creatures. Use your wits, battle fiercely and emerge victorious! *A ground-breaking adventure, bringing the 3rd Edition Dungeons & Dragons rule set to Xbox for the first time. *Explosive spell effects and incredibly detailed creatures and environments maximize the power of Xbox technology, delivering a more realistic gaming experience. *Three customizable characters, each with distinctive powers, appearances and abilities that develop throughout the game. 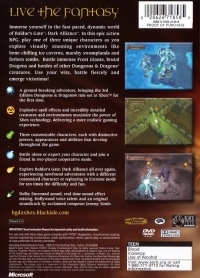 *Battle alone or export your character and join a friend in two-player cooperative mode. *Explore Baldur's Gate: Dark Alliance all over again, experiencing newfound adventures with a different customized character or replaying in Extreme mode for ten times the difficulty and fun. *Dolby Surround sound, real-time sound effect mixing, Hollywood voice talent and an original soundtrack by acclaimed composer Jeremy Soule.